Tableau’s platform is built for ease of use by IT. It means you have the features, integration, automation, and auditability your enterprise requires, right at your fingertips. Easily track and manage content, users, licenses, and server performance— directly in Tableau or with enterprise-standard monitoring tools. Get peace of mind knowing your mission critical analytics platform is powered by Tableau. Keeping track of Tableau Server processes and the capacity of the underlying system is key to maintaining server reliability. It’s also a vital part of future capacity planning. The Tableau Server status page displays server processes across all nodes including the state of the active and passive Repositories. Tableau notifies admins and content owners when extract updates fail due to data connection issues. This helps you fix the data problem before users end up using stale data in their analyses. Managing data, content, and users across your enterprise analytics platform shouldn’t have to be manual. Tableau Server has several utilities for automating your server tasks. Tabcmd and Tabadmin are our comprehensive command line utilities for managing your entire server deployment. The Tableau REST API allows you to manage and change Tableau Server resources programmatically via HTTPS. Automated deployment and scaling of Tableau Server is supported on all major VM and cloud platforms, including AWS EC2 and VMWare vSphere. Whether you’re supporting ten users or ten thousand, Tableau makes it easy for the server administrator. Our visual user permission manager helps you see exactly what roles and responsibilities each user and group inherits, for each site, project, and folder. Our local authentication method makes it easy to batch add new users. And if you’re using Active Directory, we’ll sync with your existing AD groups to maintain consistency with your security protocols. Tableau Server maintains extensive log files of data connections, all server content, and user interactions. These robust logs can be used for troubleshooting and performance assessments as well as for audit compliance. Each user’s actions on Tableau Server are captured and stored for future reference. Tableau has created open source tools such as LogShark and TabMon to help you analyze Tableau Server usage and performance data. With Tableau, you have the visibility and tools you need to optimize your platform and ensure it’s running efficiently. Customers depend on Tableau as the core of their business intelligence platform. Like any mission critical service, administrators need to proactively monitor their Tableau deployment to identify and address potential issues. As the usage of Tableau becomes pervasive within an organization, more hardware, network, databases, applications, and enterprise tools become integrated with the platform. Understanding how these tools interoperate is a key concern for monitoring, both from a troubleshooting and performance perspective. 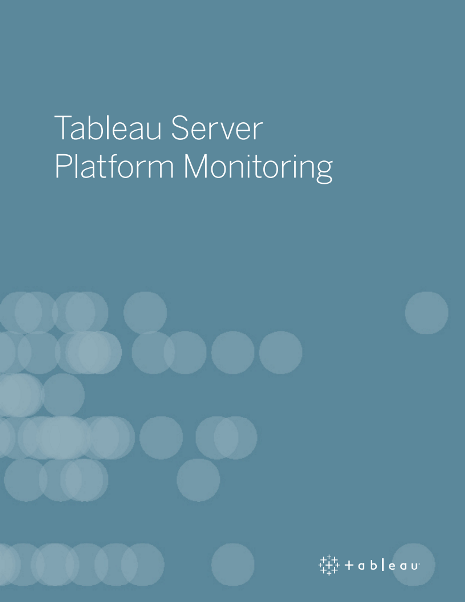 This whitepaper describes the various mechanisms available to monitor Tableau Server and understand usage across your organization.